Reconciliation: what makes it possible, what impedes it, how to foster and promote it and how to build the social conditions in which it can flourish? These are pressing questions for an increasingly significant concept in community and international relations. This book is a creative engagement with the central terms of reconciliation - forgiveness, nationhood, conflict resolution, justice and memory - and with approaches to questions of listening and understanding the 'other'. 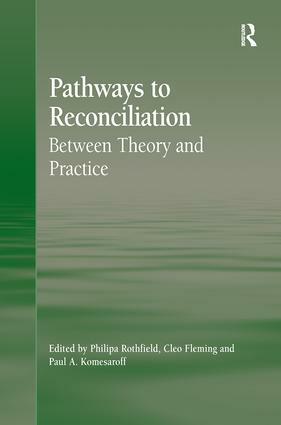 It is premised on the view that an essential pathway to the achievement of reconciliation lies in developing and disseminating critical concepts that capture the nuances of practice. Drawing on fields in the social sciences and humanities, including post structuralism, hermeneutics, subaltern studies and social theory, and elaborated in relation to contemporary sites of conflict and peace-making, this collection brings together a unique range of perspectives on the complex issue of reconciliation while offering responses to the key questions being asked of it today.